Hosted by Jon Kulp on 2015-11-26 is flagged as Clean and is released under a CC-BY-SA license. Tags: open learning materials, counterpoint, music theory, html, ebooks, epub, public domain. 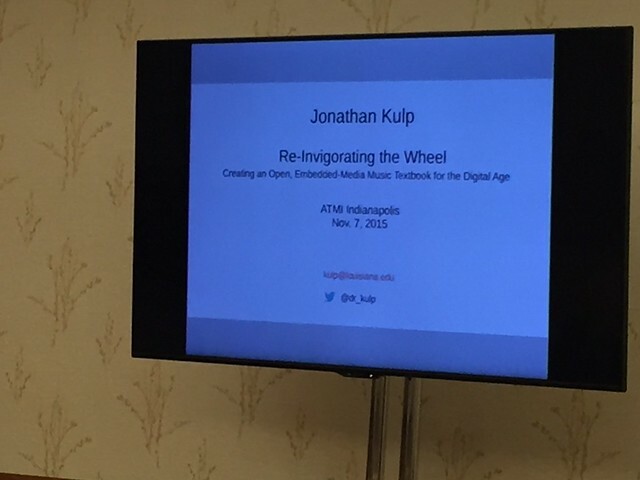 This is a recording of a presentation I gave on November 7th, 2015, at the national joint meeting of the College Music Society (CMS) and the Association for Technology in Music Instruction (ATMI) in Indianapolis, Indiana. I even have some action photos! Click on the first image below to visit the Flickr photo album, which also includes the slides from my presentation. Kent Kennan. Counterpoint, 4th ed. Englewood Cliffs, NJ: Prentice-Hall, 1999. Calibre: eBook Management software. See also documentation for the Calibre command-line interface, which is what I use to create these counterpoint books. Internet Archive: a non-profit library of millions of free books, movies, software, music, and more. Kimiko Ishizaka's The Open Goldberg Variations and The Open Well Tempered Clavier, released under a CC0 1.0 Universal (CC0 1.0) Public Domain Dedication license. Lilypond: Music Notation software for Windows, Mac, and Linux. Project Gutenberg: over 50,000 free ebooks: choose among free epub books, free kindle books, download them or read them online. Trinkets: Share Code from any Device. Trinket lets you run and write code in any browser, on any device. Terrific for embedding counterpoint exercises on web pages or learning management systems. Many of the tedious repetitive processes I had to do on image files and audio files are done by bash scripts that are launched by voice commands, as demonstrated in the YouTube video above. The processes I'm talking about are things like renaming files according to my filenaming conventions, putting the files in the right place, resizing images, converting images to different formats, optimizing them for file size, converting audio from MIDI to ogg and mp3, and reducing audio from two channels to one in order to reduce file size. Below are the main tools I use for this, apart from the Linux bash shell itself. If you're interested in actually seeing the scripts I wrote to perform the magic, I am happy to share. Just drop me an email. Calibre command-line tools: these were essential to automate the process of converting the source HTML file into the various versions and eBook formats of the book. Without this I might have thrown up my hands in defeat long ago. sox: command-line audio-manipulation tool, "the Swiss Army knife of sound processing programs." optipng: command-line png optimizer. This is important to keep the book's file size as small as possible. TiMidity++: an open-source, command-line MIDI-to-WAVE converter and player. LAME: high quality MPEG Audio Layer III (MP3) encoder licensed under the LGPL. oggenc (part of vorbis-tools): Several tools to use, manipulate and create Vorbis files (vorbis is a free audio codec). Haha true she wasn't crazy about the "free" aspect, but to be fair, musicians face an ongoing struggle against people undervaluing their skills, whether it be someone balking at the "outrageous" price for private lessons or the "scandalous" fee to play at a wedding. People think music is all fun and games, but for professionals it's hard work, a highly specialized skill developed over many years. I think her questions were coming from the perspective of someone fighting to make sure musicians' skills are properly valued. I get this. I'll definitely do a show about calibre conversions, both with the GUI and the CLI. Thanks for the comments! Thanks for sharing this presentation. I enjoyed the entire thing and will use some of your ideas in my own projects. I especially enjoyed your explanations of creative commons and free software in a way that was clear and accurate, but not too preachy. These concepts are so foreign to some people that is entertaining to hear their reactions when they are exposed to free culture. Thanks again and I am looking forward to your next show. Though it's been a long time since I have to buy one, I fully share your sentiments about the college textbook industry. The publishers block the paths of learning, raise their flintlocks at students, and cry "Stand and deliver."